You don’t have to worry about braving the cold to enjoy Crisp Winter Skies! 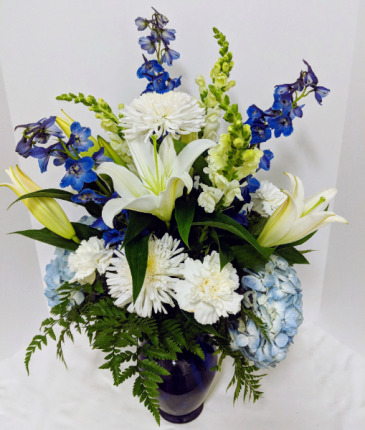 Blue skies, brisk winter air, and fresh snowfall are captured with white and blue flowers in an arrangement that will brighten even the coldest winter days. White & Blue Flowers, Blue Vase. Red & White Flowers, Red Vase. 'Tis the season to be jolly and hang up all the holly! 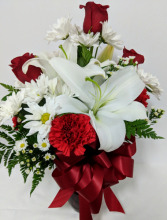 This red and white arrangement will get you in the holiday mood. Let The Flower Cottage & Gifts help you send some cheer this holiday season! 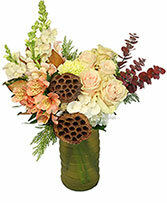 Get the winter romance going with an arrangement of soft white and pink flowers. 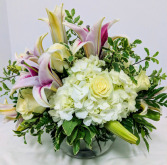 Our fresh flowers and elegant vase will put your someone special in a state of bliss.